On March 26, 2015, one day before release of the “Sunshine List”, Ontario’s Minister of Energy Bob Chiarelli announced the province has “low-income” electricity consumers who struggle to pay their electricity bills—and he intended to do something about it. What a surprise: there is no denying the Liberal government forced more households into “energy poverty.” But Chiarelli’s press release and his diatribe at the press conference didn’t use that term; he blamed the need to close “dirty coal plants”* for rising costs. He wasn’t specific on how many “low-income” households there were or how many would benefit in his announcement, which was a followup to his letter of April 23, 2014 to the Ontario Energy Board (OEB), asking for recommendations to “protect low-income residential customers”. The OEB submitted a 45-page report, and recommended “a maximum credit of $50 per month or $600 annually, with an average credit of $27.” to provide relief. The cost estimate by OEB to provide this assistance was “between $175 and $225 million” including “administrative costs of approximately $20 million” or (10 per cent of total program cost). The report suggested 500,000 households or about 11% of the 4.5 million hooked up to the grid would be in the “low-income” group. The report (dated December 31, 2014) was released to the public by the OEB the same day Chiarelli made his announcement. The media had no time to review it and question the Minister. The prior (and retained) support program, LEAP (Low-income Energy Assistance Program), in 2013 had a total cost to ratepayers of $3.7 million which is/was a cost to ratepayers of less than $1 per year. One would expect social support programs to fall under the Ministry of Community and Social Services, but with that cupboard empty and Premier Wynne and Finance Minister Sousa promising to balance the budget by 2017/18, a “revenue tool” had to be found somewhere. Wynne and Sousa presumably saw Hydro One (which just received a sizeable rate increase from the OEB) and its billing debacle as a looming “energy poverty” problem, more to do with high electricity prices. So Minister Chiarelli, who uses Tim Horton’s coffee as his reference currency, was the “go to” person. The plan concocted was, let’s ding the ratepayers! The OEB ran the numbers and told him the cost could be a “monthly fixed charge for a residential customer” of $2.55. One large “Timmies” a month or $31 a year! The balance of the costs suggested were to come from a volumetric (per/kWh) charge on other users. Chiarelli in his press release highlighted removal of the “debt retirement charge” and inferred that his cost of “less than a dollar a month” or $12 a year, support of low-come users would not impact ratepayers. The release said “Removing the Debt Retirement Charge will save the typical residential electricity ratepayer $5.60 per month” (or $67 a year). 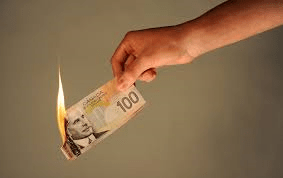 The press release failed to mention the “Ontario Clean Energy Benefit” (OCEB) will be removed at the same time, increasing the typical residential electricity ratepayer’s bill by $170 a year. Quick math indicates 4 million ratepayers would pay an extra $115 annually ($170 + $12 = $182 – $67 = $115) with the balance presumably paid by commercial consumers. So, the promise of no impact wasn’t true! Minister Chiarelli opted for the OEB to implement “a fully volumetric charge applied at an equal rate to all rate classes” via his letter of February 17, 2015 to the OEB. The letter was brought to my attention by Bruce Sharp who also ran the numbers on the cost to ratepayers. Chiarelli’s choice was to increase the per kilowatt (kWh) charge to all ratepayers so that one large “Timmies” per month became $130 per annum, pushing up the average bill on January 1, 2016 by $300! That will put the all-in rate to an average Toronto Hydro customer at 25 cents per kWh. In 2003 the all-in charge to that ratepayer was 8.8 cents a kWh—an increase of 184%! Why didn’t Minister Chiarelli insist the “$175 and $225 million” cost of this program come out of the OCEB? The OCEB costs taxpayers $1.1 billion annually, but this money appears earmarked for a revenue grab by Finance Minister, Sousa, presumably to impress rating agencies and reduce the deficit, leaving ratepayers to pick up its cost. This will push more ratepayers into energy poverty by using Ontario’s “middle class” households to pay for something the Liberal government created. Simply put, this government’s attempt to balance their budget on the backs of ratepayers is a tax grab labelled the “Ontario Electricity Support Program” (OESP). Reducing taxpayer spending by $1.1 billion by eliminating the OCEB, grabbing a further $175 to $225 million after-tax dollars (with $20 million for another bureaucracy) to fund the OESP, and $200 million more in HST from ratepayers is a Wynne “revenue tool” and a $1.5 billion tax grab! When will this government understand that ratepayers are also taxpayers? Haldimand County‘s former council appears to have been advocates of industrial wind turbines; they signed several “Vibrancy Fund Agreements” all dated September 26, 2011. The agreements will, or have already, allowed industrial wind developers to erect 198 of 400-500-foot turbines in the county. The fund disclosures come after news that those same councilors also agreed to sell the local distribution company, Haldimand Power, to Hydro One. A total of 443 megawatts (MW) of industrial wind turbines have appeared or will appear in the community shortly. Presumably to assure the current council that all is well, they recently received a report from Associate Professor Guy Holburn, PhD, Ivey School of Business, Western University. Mr. Holburn’s Case Study, prepared for Summerhaven Wind LP (on behalf of NextEra Energy Canada owned by NextEra of Florida) is dated February 27, 2015. In other words, it avoids any contentious issues! Here are highlights of a few of facts either coloured or ignored. The “study” has much to say about the Community Vibrancy Fund (CVF), which will annually contribute $1,6 million to the township ($37.00 per resident). To put the CVF in context: the 443 MW capacity should generate, on average, about 1.2 million megawatt hours (MWh) of electricity annually (30% of capacity) and receive about $160 million from Ontario electricity ratepayers for that production. It is easy to figure out that the CVF payments represent about 1% of the gross revenue. There is no estimate on whether the mandated assessed value of the turbines (capped at $40K per MW of rated capacity) will generate tax revenue sufficient to offset the potential loss of tax revenue on homes that lose value and receive assessment reductions caused by the proximity of the 198 turbines. The tax value to the township translates to $2,100 per MW annually (with a capital cost of about $1.5 million) or $21.00 per resident. Other facts in the report are coloured or outright false. As a simple example the professor claims: “Ontario is Canada’s leading province in the wind power sector with 2,480 MW of installed capacity”. The information, obtained from the Independent Electricity System Operator (IESO), as of January 26, 2015 is wrong. A visit to the CanWEA website claims 3,490 MW of installed capacity in Ontario as at December 31, 2014. Haldimand’s council should rely on the CanWEA information which is over 1,000 MW (40.1%) higher! Associate Professor Holburn also claims “on average” the 443 MW of the Haldimand located wind “farms” provide “annual direct local payments by the wind power companies”, “equivalent to $260 per person” per annum. Professor Holburn’s calculation makes the incorrect assumption that each Haldimand resident will be a beneficiary of the largesse of those generous foreign entities like Samsung, NextEra, etc. He includes Salaries for local workers and employees ($72 million1.) and lease payments to local landowners”($142 million2.). Later, the case study reveals that “salaries” include construction workers, which would be short-term employment. Associate Professor Holburn offers salary calculations without reference to supporting data. On the issue of “lease payments” the mathematical calculations suggest farmers who have signed to lease their land for wind turbines will receive $142 million over the 20 years, which translates to $16,000 per MW per year. Based on what is included in this case study, the dollar value suggested by Associate Professor Holburn is his estimate. It might be interesting to speak with a few of the farmers who have actually signed on, to determine the validity of the conclusions. If I were a member of council on the current Haldimand Board I would, as the expression goes, take this study with a grain of salt. This includes construction workers salaries and “conversations” with wind farm developers. Holburn’s estimate of lease payments suggests $16,000 per MW per annum— an estimate. NB: In an effort to promote transparency, Associate Professor Holburn should fully disclose what he or the Ivey Business School received as compensation for the production of this “case study” for Summerhaven Wind LP, aka NextEra Energy Canada. CTV on March 12, 2015 reported “Ontario’s Energy Minister Bob Chiarelli says residents shouldbe prepared for higher-than-normal electricity bills after February’s deep freeze.” Minister Chiarelli was reported as stating: “We had a really bad winter last year, and this year is equally as bad”. The truth? Ontario’s consumption of electricity in January and February of 2015 was less than power use in the same two months of 2014. The decline was only 3 gigawatts—from 25.7 terawatts (TWh) to 25.4 TWh—but it was down, not up! So why should residents “be prepared for higher-than-normal” electricity bills? It might actually have something to do with how much surplus power Ontario exported in 2015 versus 2014. In 2014 we exported 2.7 TWh in January and February; in the first two months of the current year, it was 4.4 TWh. That’s an increase of 71%. I think Ontario ratepayers would have been OK with that if, and it’s a big if, we were selling our exports for a profit. But, the sale price in 2014 averaged $73.14 million/TWh, and in 2015 that fell to $51.2 million/TWh. We sold more for less! In 2014 Ontario ratepayers picked up losses on those export sales of $63.8 million, and in 2015 Ontario electricity customers, so far, have absorbed $294.8 million in export sales losses. If we keep that pace it will cost Ontario ratepayers $1.8 billion to support export sales for the current year. That is $400.00 for each and every power customer for power they don’t need, or use! It’s strange that Mr. Chiarelli thinks “it’s the weather” rather than inane policies of this provincial government, which since it’s been in power since 2003, has taken every possible action to interfere with the electricity sector. If the government is truly “concerned about families” why have they contracted with wind and solar generators to pay rates wildly above comparable utility rates, and contracted for excess power we now export at a huge cost, and back them up with gas plants? Now that‘s a “double-whammy”! The real reason Ontario will see much higher bills in the coming months is because of the Ontario government, not the weather! Note the views expressed here are those of the author and do not necessarily represent Wind Concerns Ontario policy. Who protects endangered species in Ontario? Power developers? Government? Or ordinary citizens. Tomorrow Ontario’s Divisional Court will hear arguments on the role of government in protecting endangered species. Previously, if a project could harm a species or its habitat, government officials normally reviewed the proposal. Now it appears the Wynne government may be saying developers will decide what, if any, protection is necessary. “To us, it looks like the government has decided to put the foxes in charge of the hen house,” said Maria De Melo of Durham Area Citizens for Endangered Species, who are challenging this unprecedented approach. The hearing will take place at the Brampton Courthouse at 10 a.m., March 19th, at 7755 Hurontario Street, Brampton. Appearing for the appellants, the community group Durham Area Citizens for Endangered Species, will be the law firm of Eric K. Gillespie. Letter to Energy Minister Chiarelli: where is the missing $20 mil? Parker Gallant has written to Energy Minister Bob Chiarelli. As a ratepayer I would like to know whatever happened to the missing $20 million? For that amount you could have purchased five “Timmies” for each of us. If you could please take the time to enlighten me and the other 4.5 million ratepayers on what happened to the missing money it would be greatly appreciated. This Thursday, a group of Ontario citizens from West Grey are taking their fight to protect the natural environment to court — to fight against the Ontario Ministry of the Environment and giant, Florida-based wind power developer NextEra. The community group, Durham Area Citizens for Endangered Species or D.A.C.E.S., is going to court in Brampton, on Thursday March 19th at 10 a.m. to begin a judicial review of the process by which the wind power development project in West Grey was approved, despite the fact it will certainly wipe out habitat for an endangered species of fish, the Redside Dace. While the little fish (a member of the minnow family) is protected by legislation in Ontario, and the province even has a taxpayer-funded “Recovery Strategy” for it, in the case of the East Durham wind project, approval was granted without proper study, and in spite of known Redside Dace habitat in the Saugeen River. If you can, get to that courtroom on Thursday, and show your support for the little fish … and for Ontario’s endangered species legislation. This approval cannot be allowed to stand. Arrive at 9 a.m.; court begins at 10 a.m.
ALGOMA – The Goulais Wind Farm north of Sault Ste. Marie, is in its final stages of construction with towers and turbine blades being hoisted into place with huge cranes. Although weather especially winds and cold has impacted this phase of the project, it will be operational this spring. Not everyone is blown away. 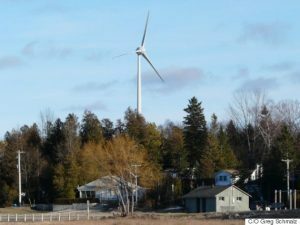 Goulais River resident Gillan Richards believes the province has misinformed the public by providing them with biased information in its move to generate energy from the wind as a renewable and green resource. “When the Ontario government decided they were going to get into big wind as a green alternative to dirty coal, which isn’t all that dirty after all, they put out these messages that have not been fair,” she said in a recent interview at her home. If the people of Ontario decide they can endorse and live with wind farms, then that’s a democratic society at work, “but the people have never been given that opportunity, they’ve been given a biased picture of it,” said Richards. When speaking about Northern Ontario as opposed to the south, she wonders why they would want turbines anymore than we would. Is it because the region up here is less populated? The huge geographical region between Sault Ste. Marie and Wawa, excluding Prince Township, is unorganized and without local governance. Unorganized townships have Local Services Boards (LSB) and Local Roads Boards (LRB), which have no allowance in the statute to become involved in electricity or its transmission. Board members are elected by the community and have specific responsibilities, such as volunteer fire services, roads and recreation. “But there’s nothing in the law that allows these groups to act in lieu of a municipal council,” said Richards. What residents want and what they end up with could well be beyond their control if the Catherine Wynne’s government continues to push on with big wind as a renewable and sustainable resource for energy production. Wynne said that she would allow a community council to declare itself an unwilling host to industrial wind turbine (IWT) development, “she would presumably not develop turbines in that area,” said Richards. If a municipality declares itself an unwilling host, there is a mechanism to do that through governance, but that mechanism does not exist in the unorganized areas between Wawa and the Sault. “What we value is the wilderness here, it’s not pristine as it’s already been mined and logged. We want to keep what’s left not just for the locals but for everyone,” she said. The tourism industry is vital in Algoma and along the route between the Sault and Thunder Bay as many well established businesses promote the “naturally gifted” and “it’s that spectacular” beauty of the area. “But you put industrial turbines that go 500 feet in the air and you don’t really think you are in the wilderness anymore, it’s really visually jarring,” said Richards. Businesses and organizations are promoting ecotourism as a viable, year-round sustainable industry. “All that carries absolutely zip weight with the Ontario government and the Environmental Review Tribunal … It is simply not allowable as a part of argument even though Premiere (Kathleen) Wynne says you can object,” Richards said. Whether it be wind, hydro, solar, coal or nuclear, the consequences must be weighed, researched and followed. All energy sources have downsides, but many are terrified of nuclear, even though it has become safer, experts say. “But they have to realize that without nuclear power backing up renewables in Ontario, there wouldn’t be sufficient power to meet consumer needs,” said Richards, who estimates almost 60% of the province’s power is produced by nuclear. The planet does not have an infinite supply of rare metals to supply those commodities necessary for the production of solar panels. Eventually these metals will be gone because they aren’t renewable. “The point I was trying to make is that there are actual, and potential, consequences to the environment no matter what present means of power generation are used as some resources on planet Earth are limited,” said Richards. Educating consumers about energy conservation and financing research into power generation production which are not damaging to environment, humans and wildlife, is tantamount, she said. “In my opinion, the Ontario government did not do its homework. In trying to correct an economic problem, it has in fact created a greater problem,’ Richards added. Then there’s the issue of migratory creatures, such as insects, birds and bats. That is irreversible harm. There is no migrant bird observatory between St. Joseph Island and Wawa, “or maybe Manitoulin Island, but there is evidence coming from Whitefish Point in Michigan,” said Richards. The Whitefish Bird Observatory in Chippewa County, Mich., is a non-profit affiliate education and research facility of the Michigan Audubon Society, established in 1978. Whitefish Point is a narrow peninsula that goes several kilometres into Lake Superior. Canada is about 27 kilometres away, but according to their website “the geography of this location makes it a natural funnel for migration. Birds of all kinds migrate between their northern breeding grounds in Canada and their warmer wintering grounds to the south. Causing irreversible harm is unethical, she said. Soon, there will be an accumulated effect of 126 wind turbines between Prince 1 and 2, and another 11 at Goulais Wind Farm. Add another 26 at Bow Lake in Montreal River. Richards said in her closing statement as a participant for the Environmental Review Tribunal hearing in December 2013, that a map published by consulting firm Stantec indicates proposed wind projects for Northland Lake, Heyden, Island, Ranger Lakes and Stokely Creek. “You come to one of the most beautiful coastlines in the world and it has turbines along the coast and in the water,” Richards said. Having attended all open houses and information sessions, she said there was an overwhelming rejection of industrial wind in Algoma. Joanie and Gary McGuffin, well known adventure/photojournalists, work tirelessly to develop Algoma as a sustainable year-round ecotourism economy, argued turbines would seriously mar the landscape. She said the Ontario government is not heeding the plea of local people to determine their own economic destiny in a lifestyle in keeping with the rural north, and no real objective long-term assessment has been done locally. For 32 years, Richards taught English at the former Bawating C&VS, a state-of-the-art facility closed and demolished several years ago to make way for Superior Heights C&VS. She also worked as co-ordinator of secondary programs with Algoma District School Board. “It was my responsibility to assist teachers to prepare their students for the Grade 10 reading and writing test,” Richards said, adding she realized that 70% of a student’s performance was not based on his or her ability to read and write but an ability to think. “My point is that where you live can be an important factor in conditioning how you think,’ Richards said. Many of her students came from the Heyden, Searchmont and Goulais areas. They tended to be physically active, hardy, resourceful and practical. It has been documented that proximity to IWTs can cause sleep disruption. “As an educator I have noted that any one, or a combination, of these factors may interfere with memory and concentration to the point where someone says, ‘I can’t hear myself think,’ ” Richards said. On April 17, 2014, ERT dismissed Moseley’s appeal of the approval of the Goulais Wind Farm. Richards said that everyone who put themselves forward as presenters, participants and expert witnesses throughout the appeal process, are not against change, but are rather looking at the fact that decisions have consequences. Save Ontario’s Algoma Region or SOAR is a Wind Concerns Ontario community group member. Richard Mann, an Associate Professor in the David R. Cheriton School of Computer Science, recently had work featured in The Australian, an Australian newspaper which is recognized as the country’s leading national news brand. Mann has positioned himself as a research expert thanks to his work on Measuring Wind Turbine Coherent Infrasound. The Australian recently interviewed Mann in regards to a controversial court case between acoustics expert Steven Cooper and Pacific Hydro, a renewable energy company headquartered in Melbourne, AU. 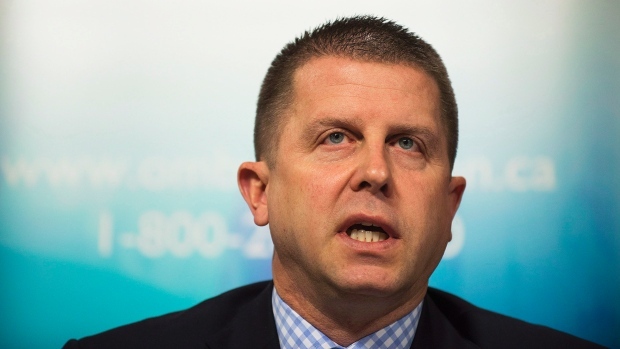 Hydro One billing problems: fixed, or not? Andre Marin, Ontario’s Ombudsman, hosted a press conference March 11th on the investigation into Hydro One’s billing practices, and the monopoly’s aggressive tactics of threatening to cut power to their customers during the coldest winter ever recorded in Ontario! Wow! The fact they had over 84,000 billing problems would indicate 7 to 8% of their customers have had to engage in negotiations, or suffer indignities including threats of having their power cut off. One wonders how many simply bit the bullet and paid up? This continuing bad news is something Bay Street investment bankers will shy away from so from the perspective of this writer (a former international banker), I would suggest to Premier Wynne, the time is not right to sell off any part of Hydro One … unless you are willing to have Ontario’s taxpayer at the ready to pay investors to take the problems away! And why hasn’t Sandra Pupatello, appointed as Chair of the Hydro One Board by the Wynne Liberals a year ago, fulfilled her promised to “fix it”? These are important issues for Energy Minister Chiarelli and Premier Wynne. Update: While Hydro One claims it doesn’t cut power during the winter months, the same cannot be said for municpally owned Westario Power with 23,000 ratepayers as noted in the Kincardine Record yesterday. These draft revisions proposed: 1. The setting of a more stringent day and night noise limit of 40 decibels for future wind energy developments; 2. A mandatory minimum setback of 500m between a wind turbine and the nearest dwelling for amenity considerations; 3. The complete elimination of shadow flicker between wind turbines and neighbouring dwellings.